Since 1980 we’ve been custom printing a wide range of paper products that are perfect for weddings, office and school environments, campaigns, giveaways and promotions. Not only do custom paper products bring awareness to your brand and event but they make great teaching and learning tools. Below is a brief description on various paper products we print. If you don’t see what you’re looking for or want to create your own custom shape for your next project, please contact us for a quote. With the wide range of paper and card stocks that we offer, your book of poems, catalogs, programs, manuals and journals will look professional and stand out. Booklets can be digital or offset printed with the option of foil stamping and embossing the cover. Popular sizes include 4″ x 5″ • 5″ x 7″ • 5 1/2″ x 8 1/2″ • 7″ x 8 1/2″ • 8 1/2″ x 11″. Books can be stapled, wire O bound, coil (spiral) bound, perfect bound and cerlox bound, contact us for a quote. Custom sizes available. Minimum order is 25 units. These handy and fun paper products are available in standard sizes 1 1/2″ x 8″ • 2 1/8″ x 7 3/4″ as well as magnetic (match book style) in sizes 1 1/2″ x 1 3/4″ • 2″ x 1 7/8″ • 1 1/2″ x 4″ when folded. Minimum order is 100 units. Provide your potential clients with essential information about your business with professionally printed brochures. Most common sizes are 8 1/2″ x 11″ • 8 1/2″ x 14″ • 11″ x 17″ with 1 fold, 2 folds (3 panels), and 3 folds (4 panels). Minimum order is 100 units. First impressions are everything and impressive business cards will make you stand out. Business cards can be digital, offset or letterpress printed as well as embossed and foil stamped on a wide range of card stocks. We also offer gloss, matte and soft touch matte laminate. Minimum order is 50 units for digital printed cards and 500 units for offset, embossed and foil stamped cards. Ordering business cheques with us is simple and easy and the cost is lower than ordering from the banks. Available in various colours, backgrounds and designs with security features included. Add your logo, company name, address and numbering sequence. Many cheque designs available that work with various accounting software. Laser and manual cheque options as well as cheque designs for tractor feed printers, contact us for a quote. Minimum order is 250 units. These high quality car mirror hangers can easily be customized with your logo, heading and message. Stock size is 3″ x 5″ with a hole and slit to place on the rear view mirror. Overall thickness is 15pt with gloss laminate on both sides. Numbering also available. Minimum order is 50 units. Great marketing items to showcase your gift cards, membership cards and more. Various styles available. Visit our Plastic Card/Card Holder page for more details. Advertise your company, product line or current special with custom door hangers. Popular sizes include 4″ x 9″ • 4″ x 10″ • 4″ x 11″ with a hole and slit to place on the door knob. Minimum order is 50 units. These promo products make great info boards for your table tops and counters, can highlight your latest specials and products and bring awareness to your event and brand. Stock sizes include 5″ x 7″ • 8 1/2″ x 11″ • 11″ x 17″. Overall thickness is 70pt (1.5mm approx). Minimum order is 5 units. Available in white wove, natural kraft or matching paper stock to your letterhead and 2nd sheets. Sizes include #9 & #10 regular and window business envelopes, various invitation, booklet and catalogue sizes as well as 9″x12″ and 10″x13″ envelopes. Minimum order is 100 units. Peel and seal envelopes also available. Get your message and special event noticed with custom flyers. Most common sizes are 4 1/4″ x 5 1/2″ • 5 1/2″ x 8 1/2″ • 8 1/2″ x 11″ • 8 1/2″ x 14″ • 11″ x 17″. Minimum order is 100 units. Multipart forms are great for invoices, work orders, receipts, vouchers and much more. Options include 2, 3 or 4 parts printed on carbonless or bond paper. Numbering, perforating, hole punching and books with wrap around covers also available. Common sizes include 8 1/2″ x 3 1/2″ • 8 1/2″ x 5 1/2″ • 8 1/2″ x 7″ • 8 1/2″ x 11″ • 8 1/2″ x 14″. Minimum order is 100 units. Whether you’re mailing out custom Christmas cards, thank you’s or corporate folding cards, these products will impress your intended audience. Popular sizes include 6″ x 4″ • 7″ x 5″ • 8″ x 5″ panel size. Foil stamping and embossing also available. Minimum order is 25 units for digital printed cards and 500 units for offset, embossed and foil printed cards. Leave a lasting first impression with our professionally printed invitations for your next business or social event. We can digital, offset or letterpress print your artwork on a wide range of paper stocks as well as foil stamp and emboss for an extra touch of elegance. Popular invitation uses include weddings, corporate parties, bar mitzvahs, graduations, birthdays, retirements and anniversaries. Most common sizes are 4″ x 6″ • 5″ x 7″ • 5″ x 8″ single or folded panel size. Minimum order is 25 units for digital printed invites and 500 units for offset, embossed and foil printed invites. With the wide range of paper types, colours and textures available, your letterhead will look professional and impressive. Foil stamping and embossing also available. Minimum order is 50 units for digital printed letterhead and 500 units for offset, embossed and foil printed letterhead. These hand held promo products are great items to use at festivals, parades and other outdoor functions that will bring awareness to your brand and cause. Flag size is 6.25″ x 4″, stapled to a 9″ stick. 5″ x 3″ flag size also available. Minimum order is 100 units. Great products to display business cards, gift cards, documents and present your clients with a professional and organized information packet. Stock sizes include 4″ x 5″ • 3 1/2″ x 6 1/2″ • 3 3/4″ x 8 3/4″ • 6″ x 9″ • 9″ x 12″. Foil stamping and embossing also available. Minimum order is 100 units except for 9″ x 12″ folders which is 25 units for digital printing and 500 units for offset, embossing and foil printing. Perfect promo products to display your specials, graphics, photos and to bring awareness to your brand. Most common sizes include 4″ x 6″ • 5″ x 7″ • 5 1/2″ x 8 1/2″. Minimum order is 50 units. Get your brand, latest event, or special noticed with custom printed posters. Popular sizes include 8 1/2″ x 11″ • 8 1/2″ x 14″ • 11″ x 17″ • 12″ x 18″. Minimum order is 100 units. Larger sizes also available. Great marketing items to showcase your product line, services and custom photos. Most popular size is 4″ x 9″. Minimum order is 50 units. These impressive and professional covers can be used to present your proposals, bids and reports. Front and back covers can be blank, embossed, foil stamped or custom printed. Front covers are available with or without a window. Report cover size is 8 3/4″ x 11 1/4″. Minimum order is 25 sets. 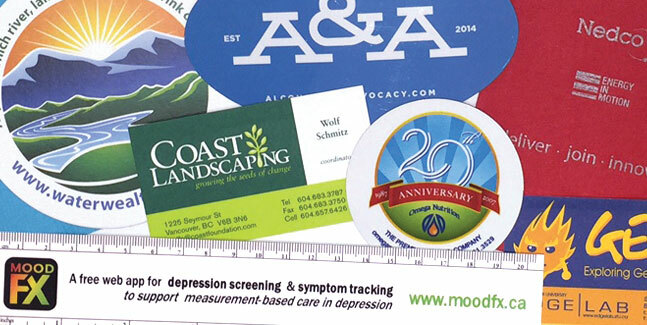 Personalize rulers with your logo, graphics and message. These promo items are handy, compact giveaways that fit nicely into purses, desk drawers and glove boxes. Stock sizes include 8 1/4″ x 1 1/2″ • 7 3/4″ x 2 1/8″. Overall thickness is 18pt with gloss laminate on both sides. Magnetic rulers also available. Minimum order is 100 units. Custom table tent cards are a great way to get your latest specials and promotions noticed. Sizes include 7 1/2″ x 4″ (horizontal) • 8 1/2″ x 3″ (horizontal) • 3″ x 5″ (vertical) • 3 1/2″ x 5″ (vertical) • 4″ x 5″ (vertical) • 4″ x 6″ (vertical). Minimum order is 100 units. Waterproof paper is very durable with incredible tear strength and can hold up to chemicals, grease, sweat and any environmental condition. Just like regular paper, waterproof paper can be cut, perforated, folded, scored, laminated and bound. Popular uses include tags, score cards, notebooks, menus, field books and notepads. Contact us for a quote on your next custom project. If you have a different product in mind and require a custom quote, please visit our Quote page. We custom print all your paper products on site at our Vancouver, BC location. Full colour orders will be converted to CMYK for digital printing and offset printing. Metallic colours and PMS colour match orders will be offset printed and is based on the Pantone® Matching System. Pantone ink numbers need to be indicated in your supplied artwork. For digital printed orders, all artwork is converted to CMYK so there can be some colour variation when compared to Pantone® colours. RGB artwork will be converted to CMYK. We provide various post press services including folding, die-cutting, cutting and laminating. See our Services page for all the bindery options. Paper products are stacked in boxes with packing paper. We can insert products into envelopes and bags, attach items to cards and more. For more information and a quote, please contact us. Visit our note pads, coasters, stickers and pin back buttons pages. Also, take a look at our Idea Guide, which provides popular promotional products for various industries and events.